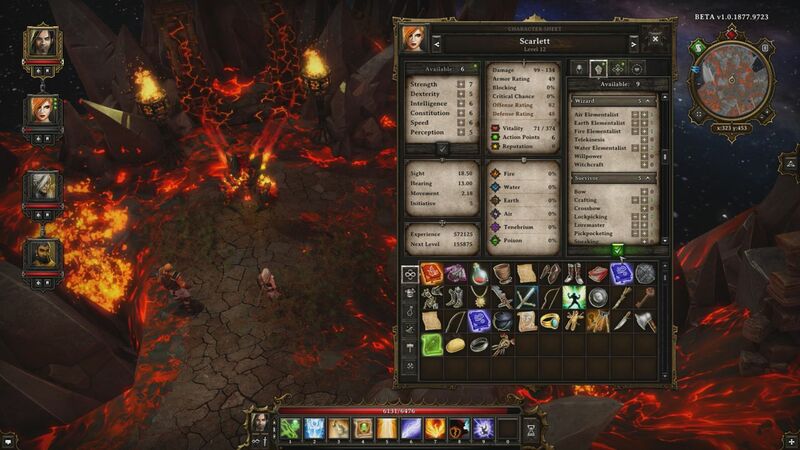 Divinity: Original Sin is a role-playing game released by developer Larian Studios in 2014. The game is a deliberate throwback to earlier classic RPGs like Ultima and Baldur's Gate, using both a top-down third person perspective and a turn-based combat system. Divinity received excellent reviews from both the official gaming press and user-submitted opinions, and my writeup here generally reflects that same point of view. Divinity excels the best in its combat system, which creates engaging tactical battles that require skillful use of positioning and terrain to succeed. 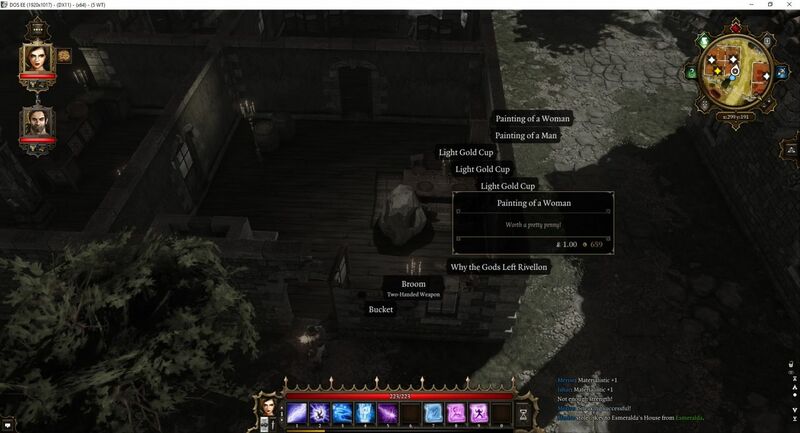 Divinity is also unfortunately weighed down by a large number of unnecessarily tedious aspects of its gameplay outside of combat, which result in needlessly difficult inventory management and a great deal of wasted time. Gameplay balance is also frequently off, sometimes severely so. I experienced Divinity primarily while playing co-op with my girlfriend, each of us controlling half of the party, and while I wasn't driven to go back and keep replaying the story over again, I had an enjoyable time. Overall, this is a title worth checking out for anyone who enjoyed PC role-playing games from the 1990s, even if it will have you rolling your eyes much of the time. We played this game in the form of Multiplayer, with each of us connecting over the Internet and controlling two characters apiece. While Divinity does allow this, the game is definitely intended to be a Single Player game. The interface for Multiplayer was extremely confusing, forcing us to figure out how to set up a game through trial and error. Many of the in-game interfaces were even worse, leading to situations where only one player could follow the conversations taking place with NPCs. We also had freezes and crashes on occasion, which seemed to be Multiplayer-driven in nature. Anyway, like I said, Divinity can be played with more than one person, but it's definitely not the intended setup. I'm going to spend a lot of time on this section, as I think it's one of the things that Divinity does particularly well. At the beginning of the game, the player is given two characters to mold as he or she sees fit. (Starting with two characters instead of one character is pretty interesting in and of itself.) There are no true "classes" in Divinity's character building setup. The game will prompt the player to select from a series of pre-generated setups, but these are only starting templates of attribute points, abilities, and skills. There are no restrictions in place in this system, and every character build can take any combination of abilities and skills desired. The player can customize the exact setup that they want before starting out, and the game's tooltip help does a good job of explaning what all of the options do. This is a really fun customization system, and it has the potential for trying out oddball or other variant paths if desired. There are four major categories in which characters are built in Divinity. The first of these is Attribute points, which are essentially your character's stats: Strength, Dexterity, Intelligence, Constitution, Speed, and Perception. Characters get 5 of these points to spend in any fashion desired at the outset, and 15 more over the course of the game, typically 1 per level up. The stats do more or less what you would expect in a game like this: Strength is used for melee fighting, Dexterity for ranged fighting, and Intelligence for spellcasting. Constitution provides health while Speed lets your characters take more actions per turn in combat; these two stats are useful for everyone. Perception is generally not too helpful (increases sight and hearing range) although it does slightly increase crit chance. The attribute points are a neat system which is unfortunately undermined by two flaws. The first is that it's way too easy to get additional attribute points on equipment, making the tough decision of where to spend your attribute points on level up somewhat pointless. By the end of the game, our characters were getting something like +20 total attribute points apiece from gear, and we were not engaging in the sort of high level crafting that can roll considerably better stuff. I like having a tough choice of where to spend my few attibute points, but it's silly when the same points are so easily available on helmets and bracers and so on. Second, there are hidden caps to these attribute points that are not explained or documented anywhere in-game. When I was playing, I was pumping Intelligence on my spellcasting character, since Intelligence increases spell damage and also grants cooldown reduction for skills. However, it turns out that any points in Intelligence over 22 do absolutely nothing! There is no indication of this fact whatsoever while playing Divinity. It's possible to overshoot this cap quite easily, as I was sitting at 30 Intelligence before reading online that a whole bunch of my attribute points were doing nothing. It's mystifying to me why this kind of cap would be in place, and it makes even less sense given how easy it is to stack attribute points from gear. Imagine if skills did no additional damage beyond level 20 in Diablo 2, even though +skills gear is readily available to take skills to level 30 or even higher. Anyway, the net result is that a good idea gets somewhat wasted by the strange fashion in which attribute points work. The second category in which players build their characters is the Ability system. This is the real meat of the game, as it also contain's Divinity's skill system, which are the attacks and spells and such that drive the combat engine. Abilities are also set up in a strange fashion, with no distinction between placing ability points into skills and placing points into passive non-combat abilities. These are very poorly balanced, and there's nothing to tell newcomers that they should be putting most of their ability points into the skills. A novice player can get really badly messed up if they sink their ability points into, say, "Charisma" (which improves how NPCs feel about you) or "Lucky Charm" (an almost totally useless ability) rather than the abilities that let your characters teleport around the map and cast fireballs. Oh, and you can respec your characters eventually, but not until about 60-70% of the game is finished, so there's little room to fix mistakes. The beauty of the system is that the player has total freedom to make these decisions on where to spend their ability points. The downside to the system is that Divinity is perfectly happy to imitate the RPGs of the past that provide no instructions on what to do, leaving many players hopelessly confused or with broken, useless character builds. Each ability has multiple levels, starting at level 1 and potentially increasing to level 5, although some of them can go beyond level 5 with additional ability points from equipment. (Yes, it's the same problem as with attribute points: a little too easy to get some of this stuff from gear.) Each level costs progressively more ability points to purchase, with level 1 costing one ability point up to level 5 costing five ability points. (Your characters do get more ability points to spend per level up as the game goes on.) Most of the abilities get slightly better with additional points, such as the "Bow" weapon ability dealing 10% extra damage at level 1 while using a bow weapon and 50% extra damage at level 5. Most characters will want to level up whatever their main weapon type happens to be for additional damage. There are also some extremely important abilities in the Defensive group that newcomers are likely to miss; "Bodybuilding" and "Willpower" give your characters vastly increased chance to resist status ailments. Get some points in both of them whenever possible, especially Willpower. Not knowing about this stuff will increase Divinity's difficulty level significantly. Crafting and smithing are also included in the ability system, with additional levels needed to craft better types of gear. It's a bit weird that these are included in the same system as skills, as there's not much incentive to put ability poins into crafting over active skills that can help win battles. Furthermore, it's easy to get this stuff from gear, so again the best option is to carry around some alternate gear that adds up to +5 crafting and simply put that on whenever you need it. Crafting is done in town, after all, which means there's no penalty for swapping items around. Magical items also need to be identified in Divinity, and this requires levels in the "Loremaster" ability. But of course no sane person is going to spend ability points here, so once again the player is forced to carry around a bunch of gear with +loremaster ability points on them. This is tedious and serves no purpose. (Much as I disliked many aspects of Diablo 3, the game had the right idea in making the stats on magical items visible immediately.) Other passive abilities grant better prices with shopkeepers, causing your items to sell for more and vendor items up for purchase to cost less. The optimal strategy is therefore again to swap to gear with +bartering points on them every time that the party visits a merchant... Anyway, I think the overall point is clear here. These abilities are well-intentioned, but no intelligent player is going to drop ability points into these things, and working around them results in a lot of tedious busywork. Whoever put this system together has a poor grasp of math and gameplay balance. It's obvious that the system grants most of its benefits up front immediately, and leads to severely diminishing returns with additional investment, when the reverse should be the case. It requires an investment of only three ability points to learn seven skills in a tree, while investing fifteen ability points only grants twelve skills. While it's true that there are some very powerful master skills, in most cases it's not worth the huge investment required to pick them up. Spending five ability points to go from level 4 to level 5 in particular is an absolute sucker's purchase. You would think that maxing out a particular skill tree would have some kind of major benefit, but the only thing gained is a single master skill. There are no passive or active benefits from additional skill levels in Fire or Air magic, only access to a higher total number of skills. That's it. Instead of spending five ability points to max out a single tree and learn a single additional master skill, the player could spend six ability points to gain FOURTEEN new skills from two other skill trees. The cost-benefit analysis is just wildly off here. The net result is that the optimal way to play the game has characters grabbing a vast number of skills from a whole bunch of different skill trees, and while it's fun to be able to mix and match like that, there's a little too much overlap taking place, as the characters wind up feeling the same. It's truly a shame that the skill system doesn't have better balancing in place, with players incentivized to max out one or two skill trees, and then a handful of complementary skills in other trees. Wait, we're still not done yet with character building! The third category for character customizaton is Talents, which are various passive bonuses that can be useful to all sorts of different setups. Your characters start the game with two talents, and every few levels they will have a chance to select another one. Talents are also not especially well balanced either and range from extremely helpful (extra attribute points, status immunities, extra spell range) to almost completely useless (carry more weight, chance for gear not to lose durability when hit). Other talents do strange things that change up the gameplay, like "Lone Wolf" that doesn't allow your character to have a companion in return for extra health and speed, or "Zombie" that causes your character to heal from poison but take damage from normal health recovery items and spells. The talents are a lot of fun and this is a great system that adds customization and flavor. Note that talents are not available on gear and therefore can't be stat twinked/abused, which is part of the reason why this system works a bit better than the others. The fourth and final system for character building is personality Traits. These are a group of eight different paired traits, such as Independent versus Obedient, and Bold versus Cautious. Your characters start out with all of the traits blank, and they will gain points in them depending on how they react in dialoge trees to various different situations that pop up during the course of the game. If you find yourself being Forgiving to others versus being Vindictive, that will be reflected in your character's traits. Humorously, even if you are playing this game alone, it's possible to have your two characters respond to these dialoge options with different results, which will then result in a game of rock-paper-scissors to determine which of the two alternatives the party will follow. Each trait has a bonus associated with it, such as Righteous granting +1 leadership skill while Renegade provides +1 pickpocketing skill. It's only possible to get one of the two bonuses for each trait pair, and a score of zero in the middle will grant nothing. I appreciate this idea to include some actual role-playing into an RPG, but the traits system doesn't quite work out in practice from a gameplay perspective. The biggest problem is that it's not clear what trait an individual question is asking the player to decide upon. How am I supposed to know if a given question is asking me to be "Compassionate" or asking me to be "Forgiving"? The only way to know is to respond, see what trait was in question after the fact, and then reload back to before the question was asked. To me, this is a sloppy oversight and the game should tell players what trait they are being asked about. I understand the counterpoint - this is a roleplaying game! answer honestly and don't try to min/max everything! - but inevitably some players will want to maximize their stat gains. It's better simply to give players the information about what trait they're working with. Furthermore, some of the benefits from traits are just a lot better than others, like immunity to being Cursed versus, umm, 20% bonus chance to hit on an opportunity attack. This is yet another place where Divinity has a great idea that could use a little more gameplay polish to even out the different options. Overall then, the trait system gets a repeat of my Civ5 verdict: good ideas, bad execution of said ideas. You will always have control of at least two characters in Divinity, your starting pair from the outset. It's possible to hire up to two more companions to create a party of four, and this is the intended group for progressing through the game. There are four potential characters to hire, largely equating to physical melee fighter, ranged archer, thief/assassin, and spellcaster. Each of them can be heavily customized after joining, of course, using the same customization system described above. One of the suggested powergaming routes is to take one of these side characters who is not being used in the active party and load him or her down with a whole bunch of crafting/smithing/bartering abilities and equipment to cut down on Divinity's inventory management tedium. We didn't know about this when playing, but it sounds like it would probably work to save some time. I was happy that we split our party of four in half, and I only needed to manage two characters. I would have found managing the attributes, abilities, talents, and traits of four different characters to be tiresome, not to mention dealing with all of their dozen or so equipment slots. I enjoying doing this for one character when playing a dungeon-crawling game in the vein of Diablo, but doing it four times over? Not so much. Your mileage may vary if you really love this kind of equipment optimization and number crunching. From my perspective, Divinity shines the brightest in its combat system. While exploring on the map, your characters will walk around freely talking with NPCs and interacting with objects. When combat breaks out, all of your characters will suddenly freeze in place and pull out their weapons, initiating the turn-based fighting system. The basic idea is that characters have a set number of action points (AP) that they can use on each round of combat. Doing anything requires using AP: attacking, using a skill, moving, using an item, etc. Some skills require more AP to use than other skills, and skills also have a cooldown associated with their use before they can be chosen again. There are no limits to what can be done on an individual turn if the character in question has enough AP. I've seen a monster attack four times in a row because it had a whole bunch of AP saved up from previous rounds of combat. Pumping speed up to the attribute stat cap is a very good idea; the more actions you can take, the more powerful your characters become. Positioning and terrain are both highly important in Divinity's battles. It costs AP to move, and all skills have a range of some kind associated with them. If you can't reach the target, you'll have to move into range or else pick another option. There are some useful-looking skills that wind up being mostly useless because they have very short (touch) range. These exact same rules apply to the enemies, of course, which is what makes the system so much fun. A poor tactical plan of attack absolutely will get your characters killed in short order. Good positioning, utilizing terrain elevation and other barriers to movement, can mean the difference between success and failure. This is compounded by the fact that Divinity's battlefields are not static environments. There are lots of skills that interact with the local terrain; for example, any pool of water can be electrified with certain lightning spells in the Air magic tree, which will cause anyone standing in them to have to roll a status check or be stunned. Puddles of oil or clouds of poison can be set on fire, which causes a burning damage over time effect. There are spells in the Water tree that can lay down patches of ice, causing anyone who tries to walk over them to run the risk of falling down and losing the rest of their turn. These terrain obstacles will then further change over time, with ice melting into water after a few turns, or fire patches burning themselves out. Manipulating the environment to your advantage is endlessly fun in Divinity, and we had some truly harrowing battles that left the landscape a weathered and scorched wasteland afterwards. I've never seen another game that has a setup quite like this one - the developers knocked this system out of the park. The game definitely suffers from an uneven difficulty level, and we found the challenge level to get easier as the game went on. This is my only real gripe with the combat system: because there are no limits on the skills that can be used in battle, the early parts of the game tend to be harder than the later parts. We initially thought that characters were limited to only 10 active skills at a time, since that's what appears on the skill bar below the interface. However, as I said above, there are no limits to use of skills, and there are actually five of those skill bars that can be scrolled between, plus skills can also be used off the inventory menu. This is one place where I believe that limiting player choice would be beneficial, as holding each character to 10 total skills for each fight would make for some tough choices. Instead, when each character can choose between 35 different skills, the skill cooldowns become meaningless and a lot of the interesting decisions go away. Divinity should be growing more challenging as time passes, not turn into a snoozefest because there are so many skills to pick between. Even with this minor nitpick in mind, the combat system in Divinity is a true winner, and essentially worth the price of admission for the rest of the game. I often felt that I was pushing myself through the time-consuming noncombat parts of the game just so that I could get to the next fight as quickly as possible. 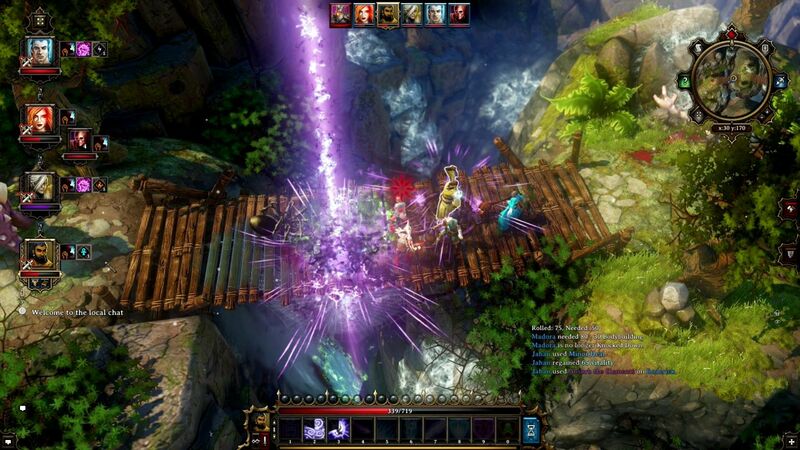 Divinity proudly embraces its status as an old-school RPG. I've read through some of the interviews that the developers did, and they were quite clear that they didn't want to make a game in the World of Warcraft mode where every objective is spelled out so clearly that any idiot could follow the directions. Instead, Divinity largely leaves the player free to wander around at will. The initial goal is to investigate a murder that likely involves evil magic of some kind, but that's only the starting point for a game that's very much an open world concept. The guards at the city gates won't try to stop you from wandering off into very deadly environments if that's your choice. They'll tell you it's a bad idea, sure enough, but the gates will open up and let you go get yourself killed. Much of the time this is a refreshing approach, and an antidote to the endless hand-holding that most modern games force on the player. And at other times, you're left wandering around in the dark with no idea what to do. Divinity is very much a game that expects the player to make a substantial time investment. Take the starting town of Cyseal, for example. There are scores of NPCs present in the town, all of them voice-acted, most of them with no particular attachment to the game's main plotline. The inn alone probably has two dozen different people inside. If you enjoy spending hours wandering through the town, talking to people, and fulfilling side quests, then this game will be your dream come true. The developers clearly intend for the player to spend a lengthy amount of time in the town areas doing exactly those sort of things. Painstaking care has been taken to make these areas feel more realistic; there are many different vendors scattered all over town, each of whom specializes in one type of good. There's a woman who only sells fish, for example, and a man who sells nothing but treasure maps of questionable value. While all this can be nice for purposes of flavor, it's also a real pain in the rear having to run all around town just to buy your stuff. We didn't even find the merchant who sells Witchcraft/Scoundrel skillbooks until we were halfway done the first town (she's hidden on the second floor of the inn in a private side room), and the game became noticeably easier after that. Is it too much to ask that there be one shopkeeper who sells skillbooks, located in the marketplace with the other vendors? This game also loves itself some quests. Lots and lots of quests. There is an autologging system that records all of the active quests, however it doesn't do the best job of explaining what the player is supposed to do in each one. Many of the descriptions border on the cryptic, which may or may not be your cup of tea. This game also likes to have lots of quests active at once, and I think we were up to almost 25 active quests at one point before finally managing to finish some of them. The quests themselves are an interesting group, some of them requiring combat but just as many needing no such thing. A lot of them are fetch quests or involve talking to NPCs and giving the proper answers. Some of them are quizzes that can be solved by reading books located in-game. Furthermore, a lot of the quests can be resolved in more than one different way, with dramatically different options in a few cases. (There's one quest in the second area that results in a public execution if you answer things in a certain fashion.) And the writing is consistently of high quality throughout all of the dialoge with the various different NPCs that your characters will meet. 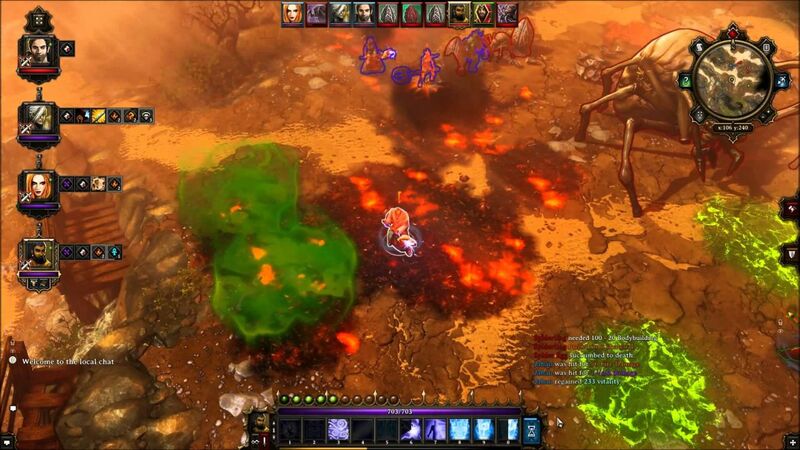 Just be prepared for a lot of talking: this is emphatically not a Diablo hack-and-slash game. The designers intend for you to spend hours running around talking with NPCs, and that's exactly what you'll be doing in Divinity. One of the more interesting aspects of Divinity is the way in which sneaking and pickpocketing works. Your characters can enter a "stealth" mode at any time out of combat, which makes them invisible at the cost of greatly reducing their movement. When characters are hidden, they can try to steal items from NPCs if their pickpocketing skill is high enough. (By the way, every single NPC in Divinity is carrying stuff around with them on their person, and it can potentially be stolen. We'll get to that subject in more detail in a minute.) Stealthed characters can also steal items laying around on the ground in people's houses, and you can even use one character in your party to distract an NPC while another character steals him blind. We had a lot of fun with this while playing. Stolen items are worth a substantial amount of gold, especially in the early stages of the game, so there's an actual gameplay incentive to do this. It's also possible to steal keys that unlock safes and treasure chests, typically with magical items inside. Characters can even pick the locks on doors and create some weird plot anamolies at times, getting the party into places that they aren't supposed to reach yet. This is all creative, fun stuff to do outside of combat, although again it requires a substantial time investment on the part of the player. You will either love this stuff and spend hours doing it or ignore it entirely. 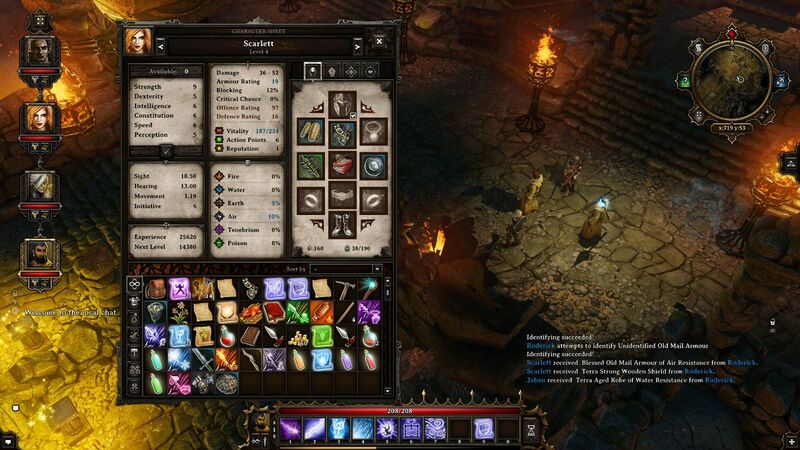 Divinity also has an extensive crafting and smithing system for creating additional items. Perhaps inspired by Minecraft, there are just dozens of items that serve absolutely no purpose other than to craft other items. Divinity loves spamming items at the player in the worst way, and the crafting system definitely reflects that passion. The full list of craft recipes is HUNDREDS long; click here to see a PDF with all of them. This is a game that distinguishes between a Rabbit's Paw, a Lucky Rabbit's Paw, a Rabbit's Paw Ring, a Rabbit's Paw Amulet, a Lucky Rabbit's Paw Ring, and a Super Lucky Rabbit's Paw Ring. A little bit of overkill on the details, maybe? Unfortunately there is no convenient list of how to craft all these materials together into other materials (outside of looking online, of course) which very much reflects the old-school nature of Divinity's gameplay. The player is supposed to read these books about crafting, which are scattered all over the game's world, each of which contains one or two crafting recipes inside. From what I've heard, all of the top tier endgame equipment comes from using the crafting system, and it's possible to make gear that's much better than what the game randomly generates. I found the whole crafting setup to be tedious in the extreme, and so I don't have much more to say about this system. It's another subgame that the player can choose to invest a whole lot of time into, or none at all. I've been talking a lot about stealing and crafting, so let's move on to the topic of inventory management. 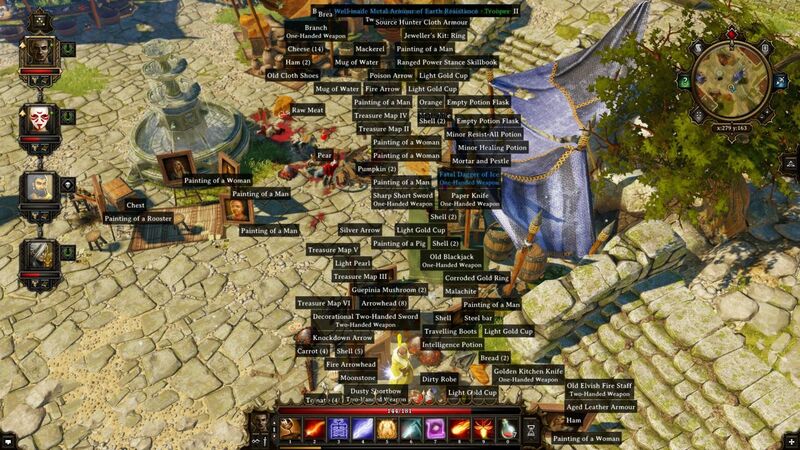 I think we spent more time on inventory management in Divinity than everything else put together. At the risk of being too crass, HOLY CRAP does this game love to spam items everywhere!!! Divinity starts out by throwing reams of crap at the player and never lets up, not for one minute, from the start of the game to its conclusion. Every NPC is carrying around items that can be bought or sold or stolen. Every room has items scattered about everywhere: books and candles and paintings and cups and so on. There are tables set for dinner that have each individual piece of silverware laid out. There are bookshelves where every single book is listed individually, each one with different contents inside. When you defeat a group of monsters in their lair, the loot won't be found in a single treasure chest, oh no, nothing as simple as that. You'll instead find several dozen individual items scattered about, each of which must be picked up individually. Don't expect to find a pile of 1000 gold - it will be sitting around in 37 little bits and pieces. Even the wilderness is full of crafting materials around every turn. I think an appropriate metaphor comes on the starting beach, where you start finding sea shells within the first 30 seconds of gameplay. These shells are completely useless and do nothing, but you'll still see them scattered everywhere and be tempted to pick them up as you go. I sometimes wonder if Divinity was an attempt to drive obsessive compulsive people completely insane with its ridiculous item spam. So you're going to end up with some items. A lot of items. What does the player do with them after that? As it turns out, the vast majority of them are completely useless, selling for 1 gold at a store. Most others are only useful for crafting purposes, which means that they are also useless if the player doesn't want to invest time into that particular subgame. Divinity thankfully does have sorting filters for separating items out by type, but this only helps so much. We wasted untold amounts of time trying to separate the few items that were genuinely useful from the endless piles of unimportant crap. (The amount of stolen paintings and golden cups that I sold has to have been off the charts, as they were two things that actually held value.) Trying to keep your inventory screen neat in Divinity is a Sisyphean task, probably about as much work as keeping your actual living space clean. Compounding this problem further, there's no distinction at all between critical plot-sensitive items that must be kept around and the endless accumulation of useless junk. By the end of the game, we were carrying around dozens of keys because we couldn't remember which ones had already been used for their plot-related purpose and which ones we still needed. You would think that the important stuff would be colored differently, or have something to indicate their status - and you would be wrong! It all looks identical. Furthermore, used keys do not disappear from your inventory, nor does anything similar happen to other one-time-use stuff. Unless you're paying incredibly close attention to every item that you pick up, which is itself a nearly impossible task given the mountains of item crap that you will be sorting through at all times, you'll quickly lose all track of what's important and what isn't. And then there are the books. This game loves its books in the worst way imaginable. There are books absolutely everywhere, with a million different purposes: explaining the background history of this world, detailing some of the crafting recipes, providing humorous little jokes, outlining how to use some of the game's skills, and so on. The vast, vast majority of these books are completely unimportant to the gameplay and can be ignored unless the player wants to dive into the background lore of this game's setting. However, in a few places, there are a handful of books that are absolutely critical and must be read in order to solve puzzles and continue progressing further. These books look exactly the same as every other book in the game, and can be found scattered amongst other books that serve no purpose. It appears as though the game's designers truly intended for players to read through all those endless pages of text so that they can sort out the 1% of useful material from the 99% of dross. Needless to say, we used an online FAQ to make it through these puzzles and did not feel bad about doing so. There's a sequel to Divinity that's under development at the moment. That game would greatly benefit from streamlining some of the inventory management headaches of the first title. There's just no reason to force players to spend so much time sorting through the massive quantities of item crap to pick out the stuff that they actually need. We didn't find this to be fun, and I doubt most other players enjoyed this either. For all of its annoyances, Divinity: Original Sin was an overall positive experience for me. As I said before, I recommend checking this game out based on its combat system alone. The developers clearly put a lot of passion into creating this game, and even though they go a bit too far in their desire to create an old-school "no handholding" environment, it's refreshing to come across creators who give their audience some credit for being able to figure things out on their own. Some of the battles in Divinity can be truly epic, especially if you don't really know what you're doing and are constantly walking the knife's edge between success and disaster. It's also a real hoot to play this game with someone else, "accidentally" electrocuting their characters or lighting them on fire. That was all completely unintended, I swear! This game can probably be picked up on Steam or GOG at a discounted rate by now without too much trouble. If you enjoyed any of those classic PC role-playing games from the past, this should easily be worth $20.